ePublishing Knowledge BaseePublishing Knowledge BaseePublishing Knowledge Base Creating, Managing, and Selling Products How do I make sure customers create an account or are logged-in when buying products? You have products that require the customer be logged-in to actually get or fulfill the order. A classic example is a "drink by the glass" article or video that can only be viewed on the site. These users must be logged-in or, if they are new to the site, create a registration as a part of the checkout process. By default, we make this must add password step in the cart optional. This is commonly known as Guest Checkout. If you have products that make Guest Checkout unwise, this can be turned off. Open your System Settings found under Sys Admin on your dashboard. Click Edit next to payment.guest.checkout.enabled. If you don't see this system setting, talk to your project manager. Zoom: Click Edit next to payment.guest.checkout.enabled. If the Value is false, all customers must be logged-in during the checkout process or add a password as part of their checkout. 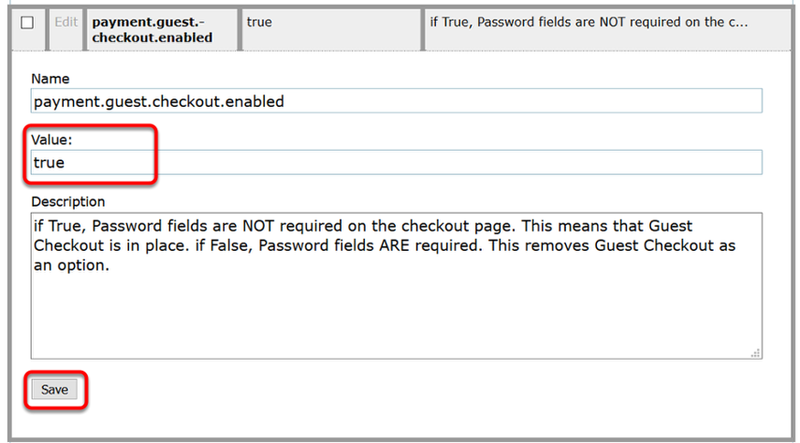 If the Value is true, password fields are not required on the checkout page. This means Guest Checkout is in place. If false, your customers will be required to enter a password or be logged-in. This removes Guest Checkout as an option. Zoom: If the Value is false, all customers must be logged-in during the checkout process or add a password as part of their checkout. Do NOT change the Name or the Description of this system setting. Only update the Value if needed and click Save. Zoom: Do NOT change the Name or the Description of this system setting. Only update the Value if needed and click Save. 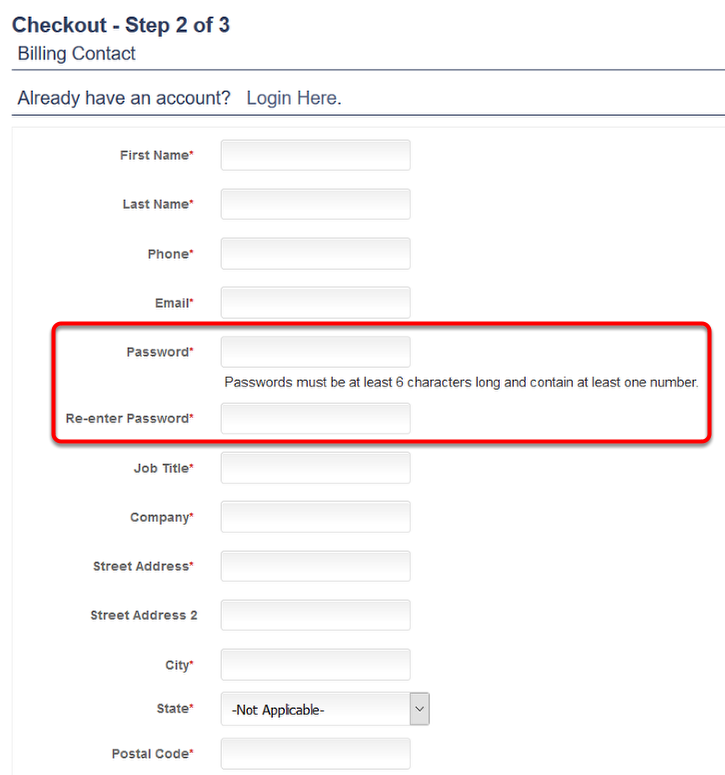 In the below example, the password fields are required. 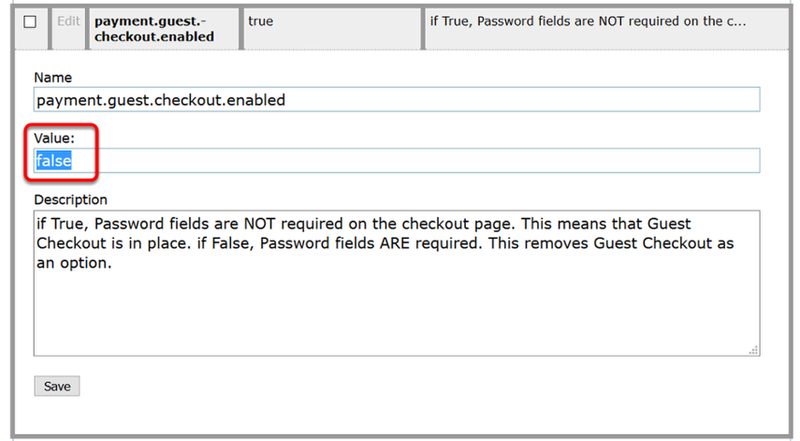 If Guest Checkout were enabled, those fields would not be required. Next: Why is my product requiring a user login when it gets added to the cart?